I'd semi-forgotten about this book, but was reminded by Bob Lefsetz's e-mails about his encounter with Gene Simmons, recounted here, here and here and shown here. Nice to see Gene hasn't changed very much. He's still a clown. Actually, it's not nice at all, just kind of pathetic. Kiss And Make-Up. Gene Simmons. Three Rivers Press. 304 pages. I don't like the band Kiss. And I won't put their name in capital letters, either, but more about that later. I've nothing against spectacle, or style rather than substance, but beyond smoke and mirrors, I need more. But that's just me; I don't like vanilla ice cream, either, and you may adore it. That's why there's more than one flavor, right? But I do admire deft and capable marketing, to be sure. In this day of media saturation and advertising clutter, any business that rises above the din, makes itself known and flourishes over a period of time earns my respect, if not my affection. Kiss is certainly one of those, and Gene Simmons — its most vocal member and the architect and visionary behind their marketing mastery — has written a most revealing biography that's popped up on several lists of best-selling business books. No wonder! Simmons, who was born Chaim Witz in Israel then emigrated to America and became Gene Klein, makes no bones about his goals: "I had always seen the band as a means to an end — in my mind, making music was only part of the plan. The master plan was to create a cultural institution that was as iconic as Disney. From the very beginning, we were at the forefront of rock-and-roll merchandising: We had the usual products, like T-shirts and posters, but we also had an interest in expanding into other markets." Indeed, the music created by Simmons and crew is fairly derivative rock-and-roll, if that's not a redundancy. Their music received minimal radio airplay in the '70s despite being issued by one of the most aggressive marketing entities of its day, the now-defunct Casablanca Records, in an era when the market was far more malleable than it is today. The Kiss singles that broke through Top 40 radio (progressive rock stations generally ignored them) were propelled by credible album sales resulting from endless touring and solid merchandising born of canny branding. 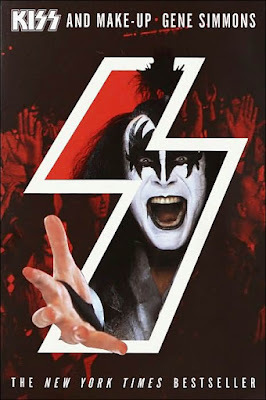 Simmons' intuitive understanding of the youth culture of the 1970s and the effective exploitation of his band's literally colorful personae made Kiss millionaires. (The four members wore makeup, in the manner of Japanese Kabuki — or clowns — take your pick.) Fearful and determinedly ignorant — but pious — parents branded the band devil-worshipers, with their name standing for "Knights In Satan's Service" or some such nonsense. "Kiss" became "KISS" in the press, aiding the branding process, no doubt. Simmons' story is a terrific first-person course in business. The lessons are powerful and can be applied to many products and services, not just pop music. Product development, human resources, production, distribution — as well as marketing, marketing and more marketing — are taught by a master practitioner. The writing, presumably the product of Simmons and an uncredited collaborator, is facile and workmanlike, with little embellishment or artifice; it's functional, fairly upbeat and fast moving. The author's personality, however, is unsympathetic, if not repugnant. His ego and narcissism are vulgar and off-putting. But Simmons probably couldn't care less as long as the money rolls in. Lessons can be derived there, too. published April 8, 2002 in The Miami Herald.